People often ask us, "What do you guys do with all your time?" 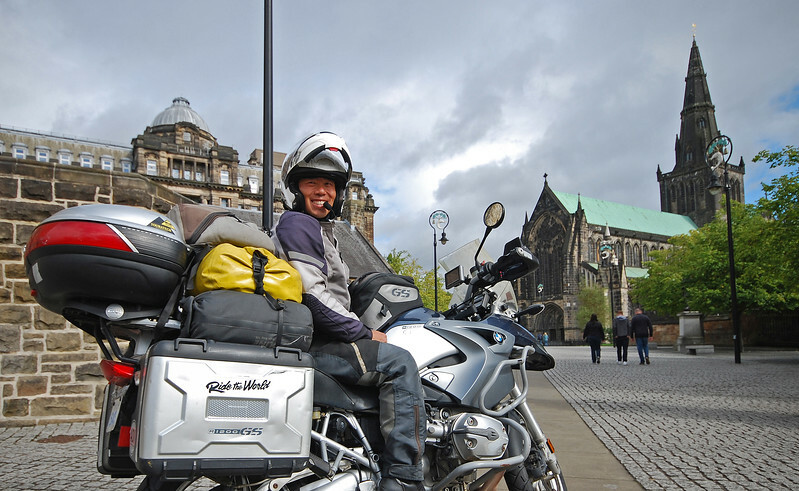 You mean, when we're not busy riding around the world on motorcycles? Actually, in between all the scrounging for food and shelter, and figuring out the next place we're going to, we do have *some* downtime. Neda reads and cross-stitches. I pretend to update the blog. And we both watch lots and lots of TV and movies on our laptops. Not just any TV shows. British TV shows. We both love the Brit sense of absurd humour. Over the years, we've binge-watched Doctor Who, Misfits, Being Human, Humans, Black Books, Black Mirror. We like Monty Python and of course, Neda loves Harry Potter. 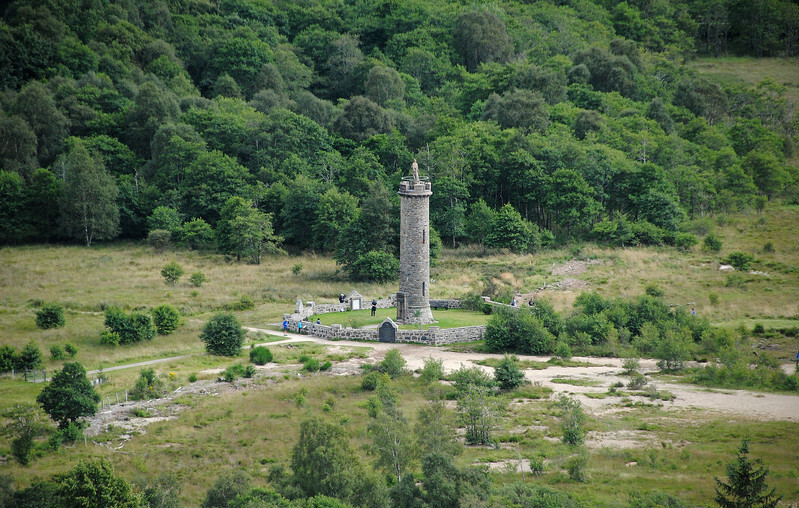 We talked to our neighbour Eric, the Texan, before leaving the campsite this morning and he told us that him and his wife visited the Glenfinnan Viaduct the other day. If this doesn't ring a bell then you are no Harry Potter fan. 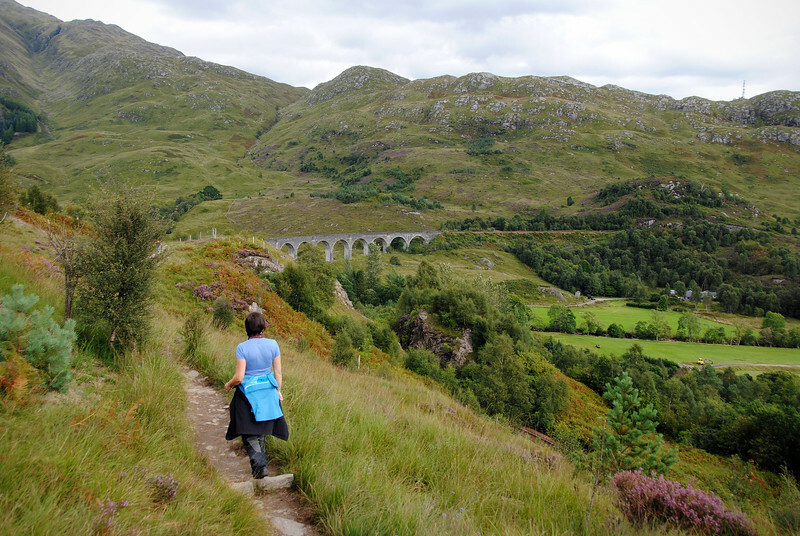 I had no idea what the the Glenfinnan Viaduct was. Neda had to fill me in that this was the railway viaduct that Harry Potter and his wizard buddies take to get to Hogwarts. Okay. I guess we are going, then. We duck into a pub to get free wifi. The haggis unfortunately was not free. Wifi needed to find a place to sleep tonight. Haggis needed because... well, haggis. 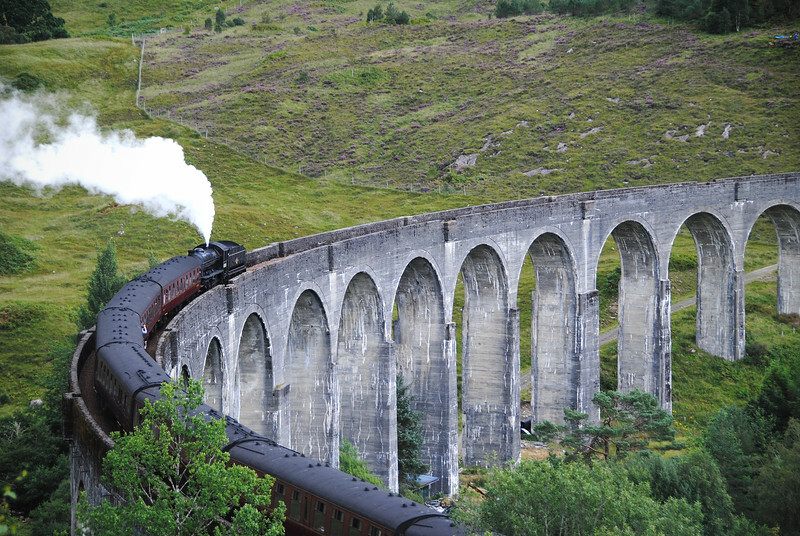 With our bellies full and a place booked for the evening, we head out to go find this Harry Potter viaduct. There's a stationary dining car here, similar to the one we slept in at Rogarts train station in the north. 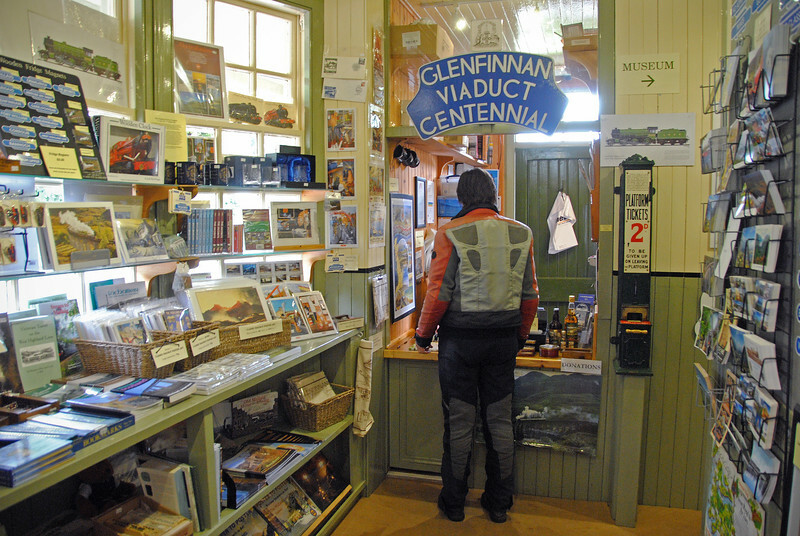 But this being such a tourist attraction, the prices are very expensive. Glad we got slightly less expensive nosh in town. Do we have to pay to see the viaduct? No. But we get a free timetable and map so we don't get lost! Map? Why do we need a map? How far is this viaduct anyway? 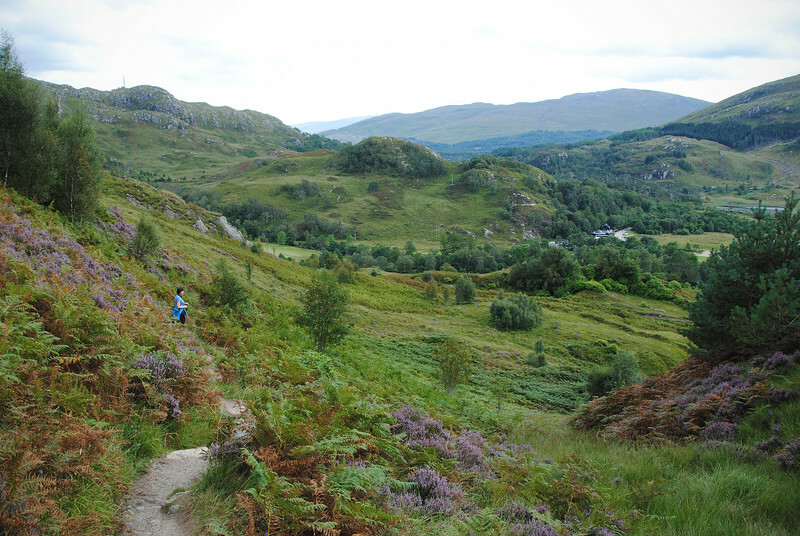 Apparently, hiking is quite popular all over the Scottish Highlands. I don't quite understand why. 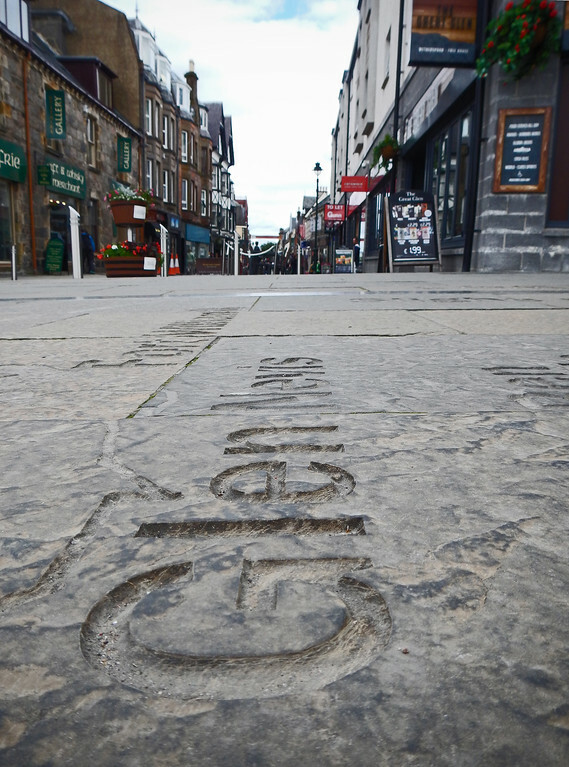 Not why it's popular in the Scottish Highlands. I don't understand why hiking is popular. A lot of hiking can be circumvented with a good zoom lens. "We don't have to go all the way there, Neda." *click* "Because this is what it looks like. We can go home now, right?" There are lots of people waiting around for the train to show up. They're all sitting on rocks or standing around on the steep hillside, selfie-sticks and cameras in hand, waiting to get their Harry Potter memorabilia snapshot. 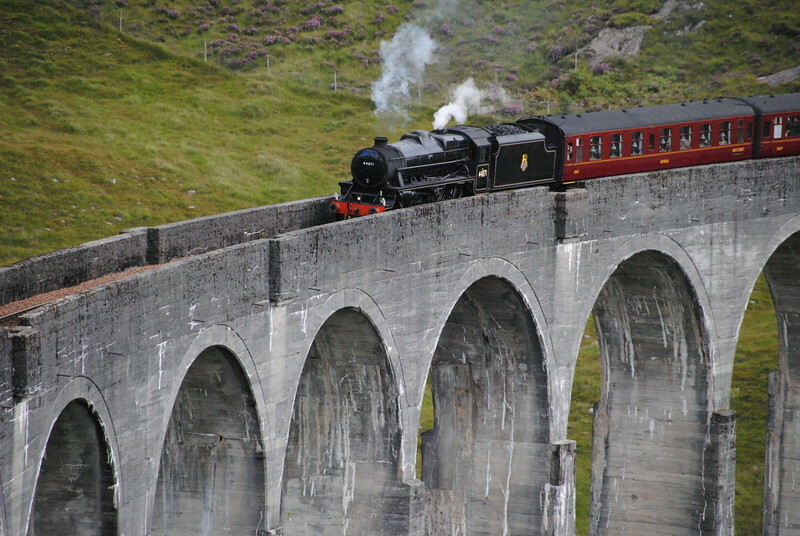 The tracks are part of the West Coast Railway and the trains that make the 65 km run between Fort William and Maillaig are special steam locomotives called The Jacobite. I'm discovering that the people here are not only Harry Potter geeks, but also train nerds too. All around us, a flurry of camera shutters are clicking open and close. Manual ones and the digital ones that mimic that shutter noise. 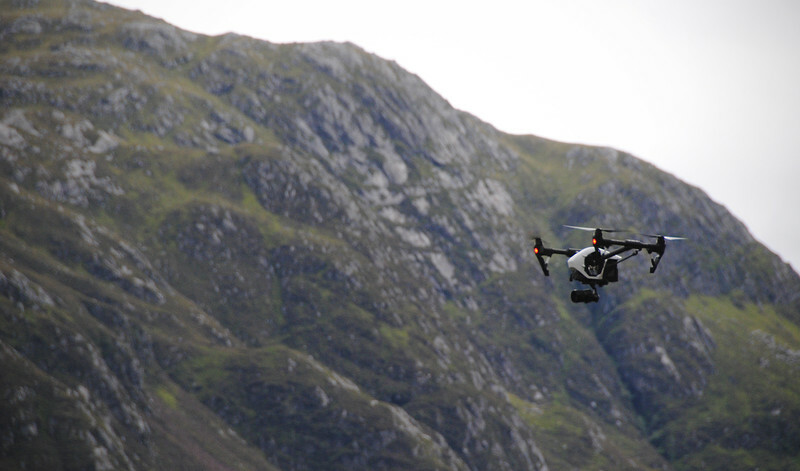 Thankfully, the drone operator has sent his bumblebee swarm far out of sight so we're all able to enjoy the view without the incessant buzzing about our heads. 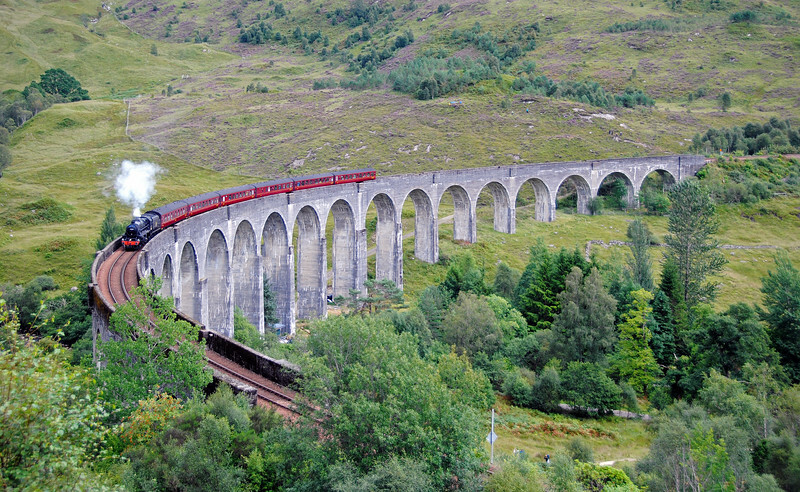 I think I remember this train from the Harry Potter movie now. Harry and his wizard buddies were inside the train and it was being attacked by the Dementoids. They were a bunch of escaped prisoners from the mental institute, Azkaban, led by Harry's evil uncle Sirius Black, who was missing a nose. Or something like that. another steam train goes by in the other direction! Two trains! For the price of... well, a hike. The sky has been threatening rain the entire day, and it opens up just as we reach our bikes in the parking lot. 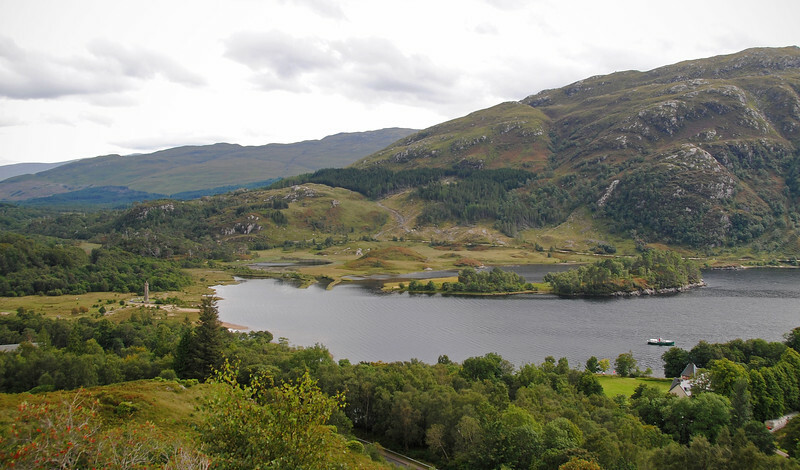 This is a shame, because although we are officially departing the North Coast 500 Loop - it returns to Inverness on the east coast, there is more amazing scenery as we turn south towards Glasgow. 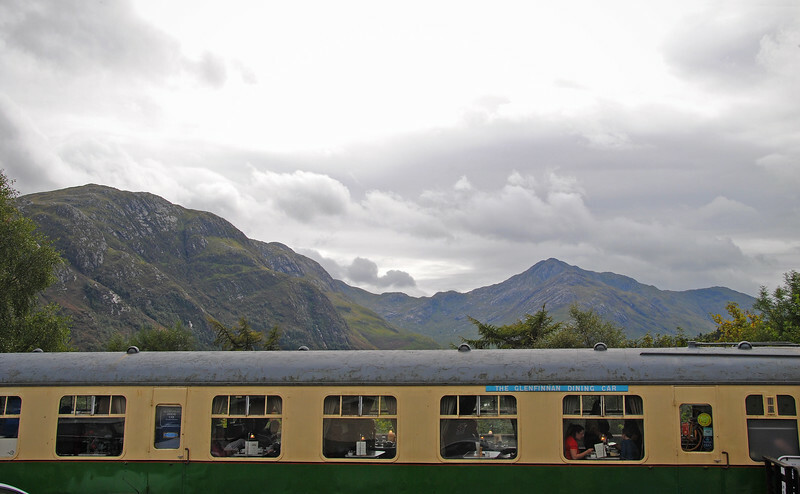 On the way, there is a valley just past Glencoe, where Skyfall (another British movie) was filmed, and it's just breathtaking. But since it was raining, no pictures. Hi. 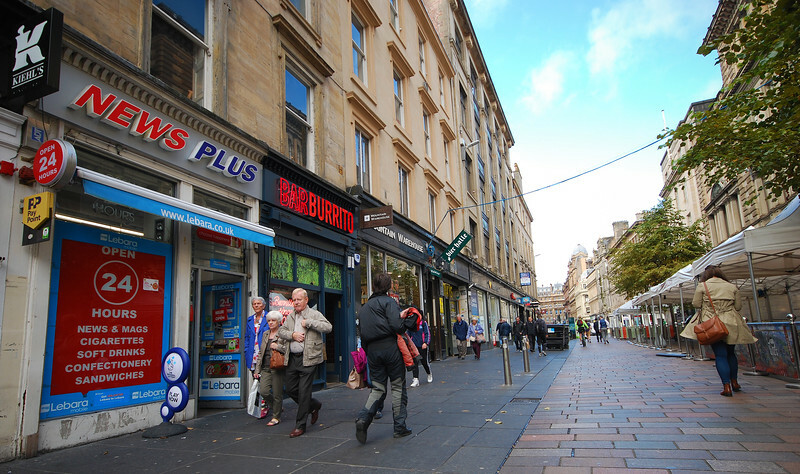 We are in Glasgow and it's stopped raining. This is our hotel. Yes, we are splurging on a hotel. Cheaper here than up in the Highlands. 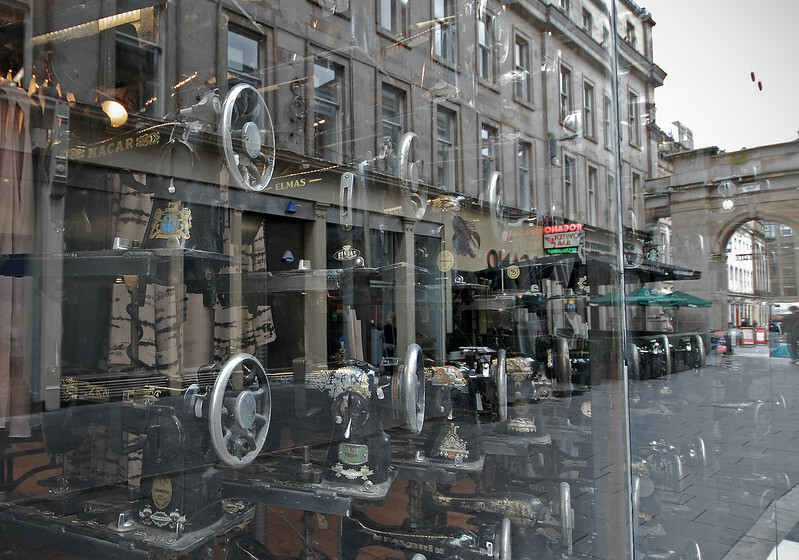 Although Gino and Fiona live in Edinburgh, they work here in Glasgow. 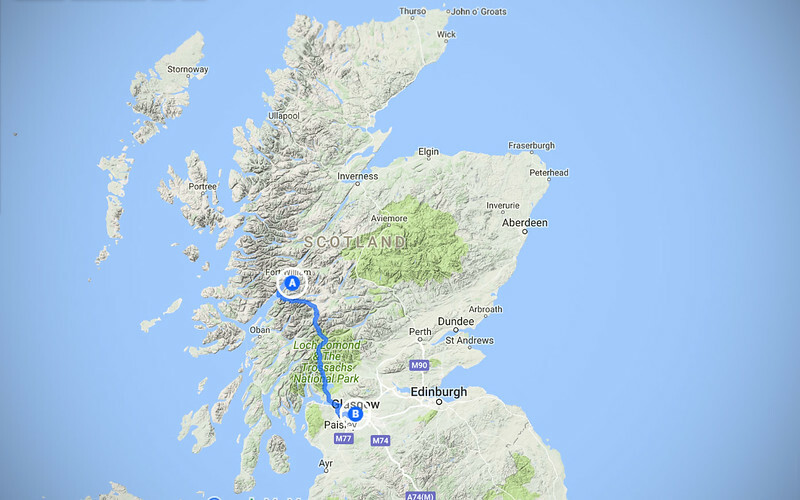 While it took us over a week and half to ride the long way around the North Coast 500, it only takes them less than 90 minutes to drive directly between Scotland's largest cities. Or 50 minutes by train. It's much more fun going the long way. 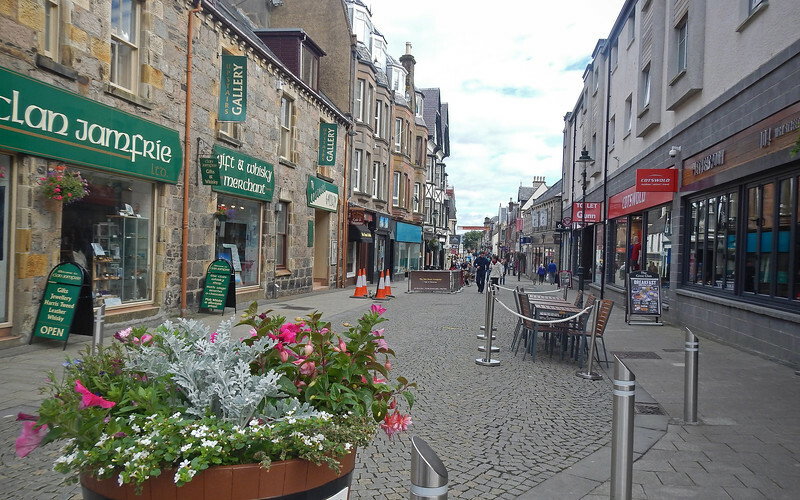 On their lunch break, they take us out for sandwiches in the park and quizzed us on our time up in the Scottish Highlands. 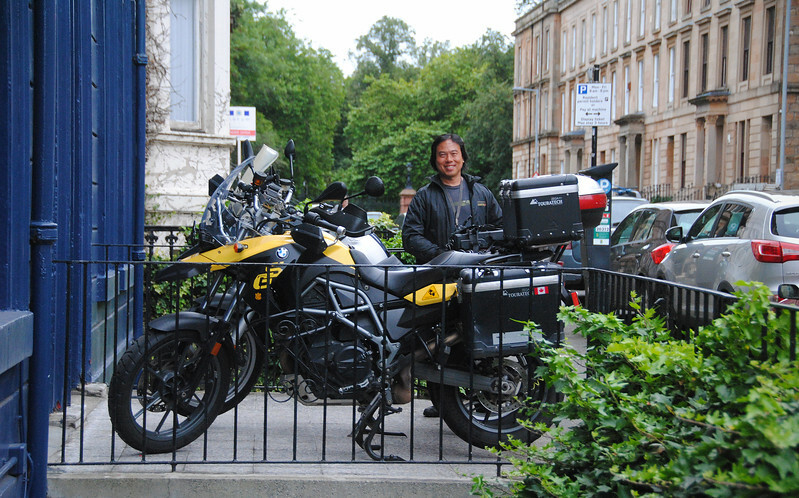 They were actually in Applecross themselves for the weekend, but we were somewhere near John O'Groats at the time. Must be nice to have such an awesome playground in your backyard! 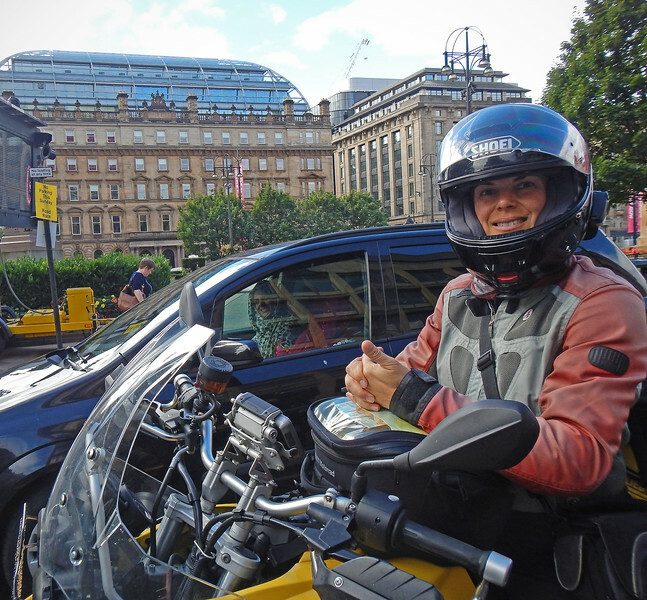 After lunch, we hop on the bikes and head downtown for a tour of Glasgow. 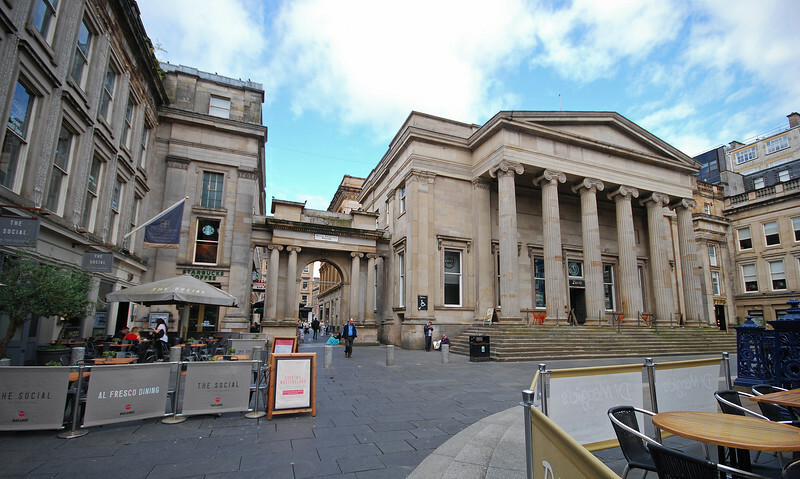 Strange, what's an Ancient Roman building doing in downtown Glasgow? Like it's been displaced out of time and space...? 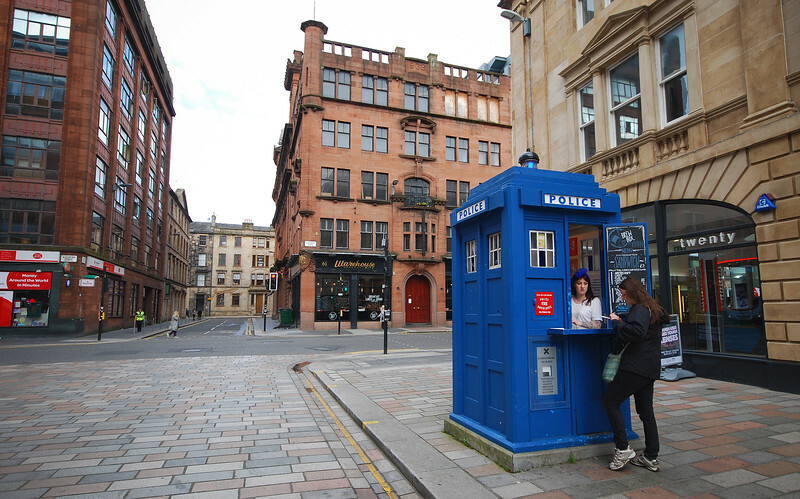 We're continuing our scavenger hunt for TARDISes and Glasgow is the TARDIS capital of the world. There are so many of them scattered around the downtown area. TARDIS stands for Time And Relative Dimension In Space. It's Doctor Who's Time Machine, and another prop from a British TV show that we both watch avidly. 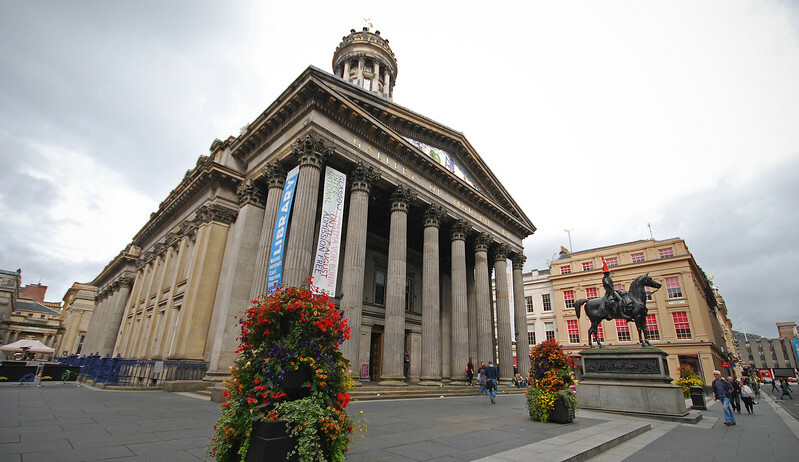 Yes, forget about the hundreds of years of Glaswegian history and architecture. We're more interested in blue boxes from a TV show! Don't worry, it's bigger on the inside than it looks. This is a prime example of why we love British TV. 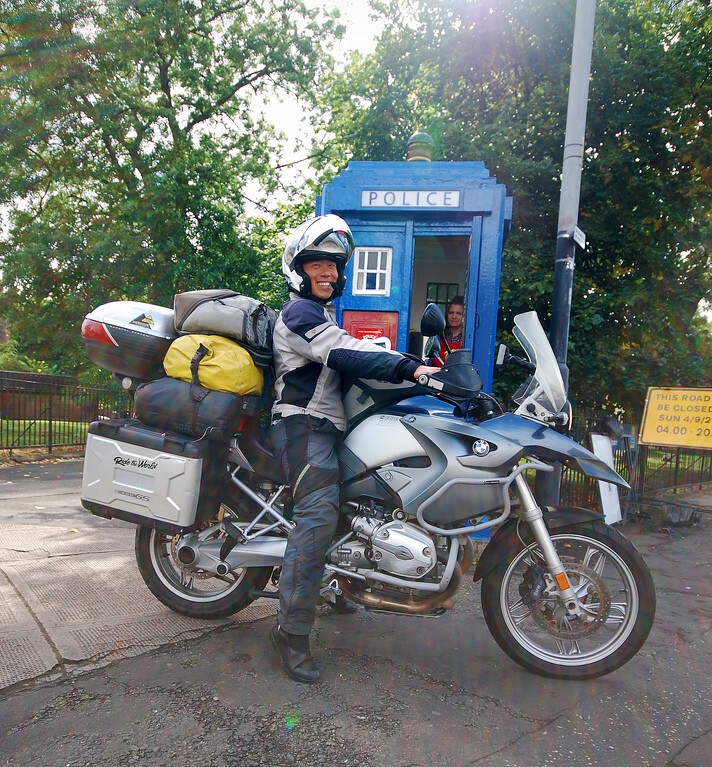 A visiting alien's time machine turns out to be a blue police box. Totally absurd! The way they explain it is that the TARDIS is able to change it's shape and form to blend in with whatever surroundings it materializes into. 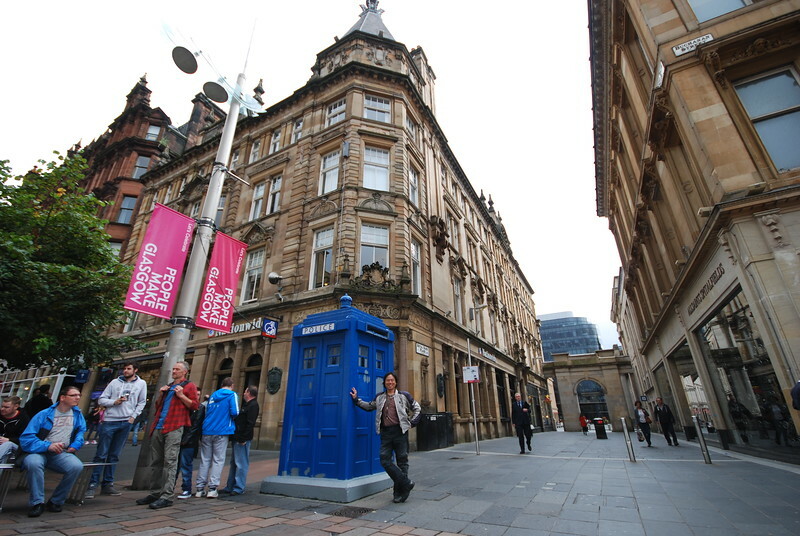 One of the first places Doctor Who visits is the UK (of course, it's a BBC production!) However, shortly after, the TARDIS's shape-shifting circuitry breaks down and ever since, it's been a blue police box - for the last 54 years. Or thousands of years, if you go by the show's timeline! More walking. But no more TARDISes in the area. An English church in Scotland? Surely that must be out of time and place! 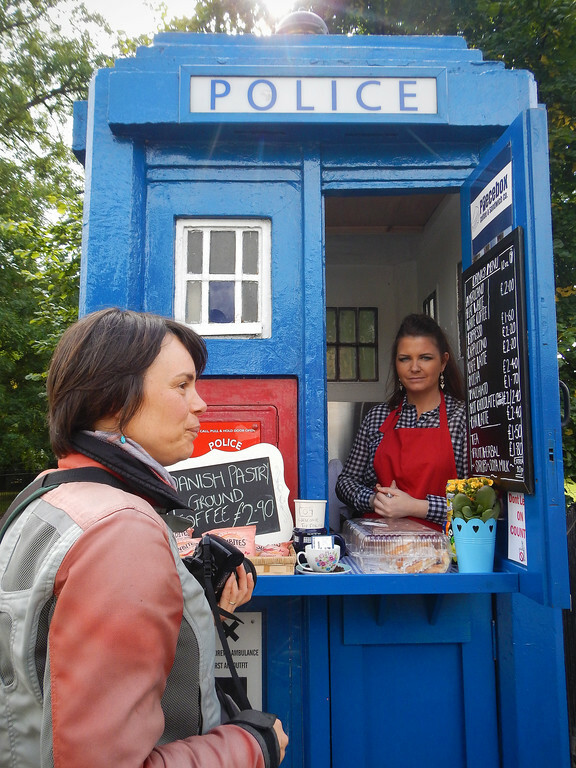 "Excuse me, my husband would like a picture in front of your TARDIS, is that okay?" "Of course, why do you have to ask?" Oh Em Gee. We are such kids.